On small cliff on far right edge of Taipan Wall. Walk past Lower Taipan Wall on tourist track, continue up slab then follow track as it hooks 180' back left and heads towards Mt Staplyton. When the track turns right, bush bash in for 50m to cliff. Alt access to to walk directly right of Spurt Wall to the Sheeps bouldering cave. Another 50m right and above is the crag. Above Left: Plaza Strip Topo. Above Middle: Mark on Technorganica (23). 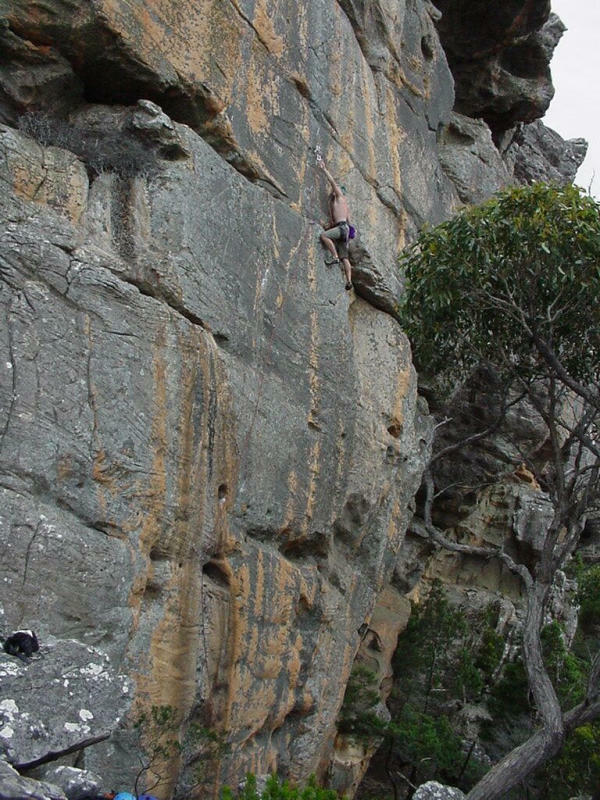 Above Right: Nick McKinnon gets in quick for the second ascent of Bass Rush (23). Thin crack splitting wall above easy layback crack 10m right of Pentridge Smack Delivery. 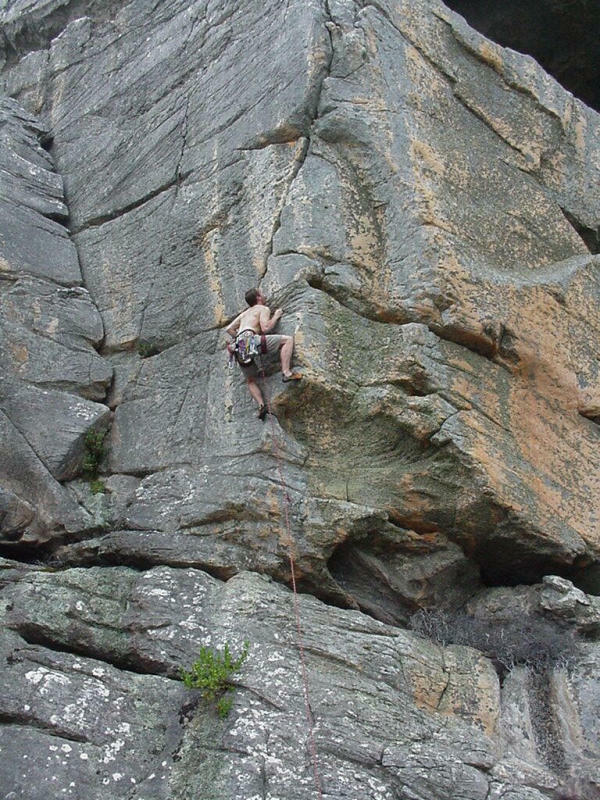 After reaching big break at 15m keep climbing upwards to belay on large ledge. FFA Andy Hein (US), Neil Monteith 03.12.2000. 5m right of OM. Climbs slab then crack on left side of mossy overhung orange prow. Despite appearances this route is clean, has huge jugs and good gear. Belay in cave and rap off Technorganica's anchors. FFA Nick McKinnon, Neil Monteith 03.12.2000. 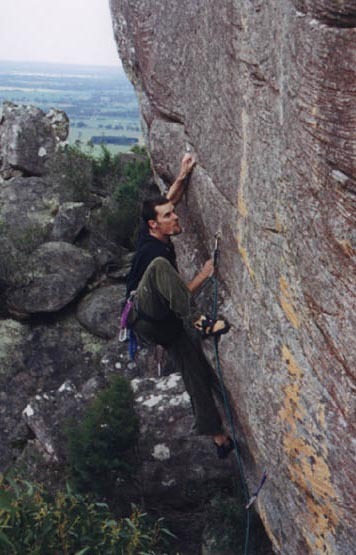 Right: Neil on second ascent of The Finisher (19). 10m right of easy layback. Sustained and thin climbing up orange wall. Four RB's and some small/medium wires for crux. Rap off ring and chain. FFA Neil Monteith, Andy Hein & Nick McKinnon 03.12.2000. The Plaza Strip - Neil Monteiths web site, for more pics and latest updates.